AMONG THE plays featured in the upcoming Galway Theatre Festival is Tara McKevitt’s Grenades, winner of this year’s RTÉ PJ O’Connor Award, which is being staged by Mephisto Theatre Company. Set in Northern Ireland in the 1970s/1980s, Grenades tells the story of a young girl, Nuala, whose family is caught up in a terrible conflict. She and her brother are thrust into a violent and adult world and their growing awareness of it leads to disastrous consequences for them and their family. Ten years later, as she waits in a prison, she tries to make sense of her memories. Grenades is McKevitt’s first full-length play. 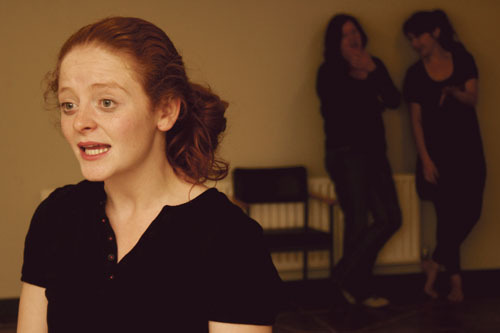 From Donegal, she had been working with BBC Scotland before taking a career break to enrol in NUIG’s MA in drama and theatre studies course, which has proved a fertile breeding ground for new theatrical talent over the past few years. “That’s where my writing really started,” McKevitt tells me. “I really enjoyed the MA’s writing module given by Elizabeth Burke Kennedy and she gave me very good feedback. Later, I also got great feedback from Thomas Conway, the new writing manager at Druid. McKevitt goes on to expand on the inspiration behind Grenades. “I was writing about a personal situation in my life in a fictional way,” she says. “In the play the main character is 19 but she recalls a moment when she was nine and thought her brother was Jesus. While Grenades won the PJ O’Connor Award for radio drama it was actually originally written as a stage play so its production by Mephisto sees it being presented as it was first intended. The play is directed by Caroline Lynch and performed by Emma O’Grady and is being staged at Nuns Island on Friday October 29 and Saturday 30 at 8pm. Tickets are available from the Town Hall on 091 - 569777.